It was the first night launch of a U.S. human space flight and the final manned launch of a Saturn V rocket. 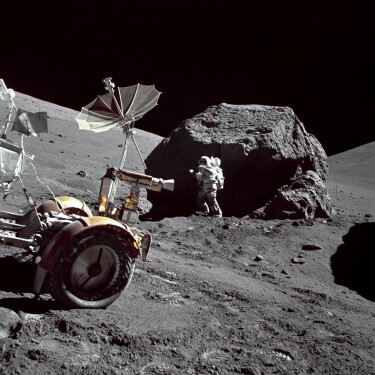 The mission consisted of a three-day lunar surface stay, extended scientific exploration, and utilization of the third Lunar Roving Vehicle (LRV). With Evans remaining in lunar orbit above in the Command/Service Module, Cernan and Schmitt spent just over three days on the lunar surface in the Taurus–Littrow valley, collecting lunar samples and conducting other experiments. Cernan, Evans, and Schmitt returned to Earth on December 19. Apollo 17 remains the most recent manned Moon landing and also the last time humans have travelled beyond low Earth orbit.